This is the 4th leg of my son, Matthew Morrison, and my "America By Amtrak" Tour. This Carolinian segment, which left Washington, DC at 10:53 am, includes photos from the train of Alexandria, VA; Quantico, VA; Fredericksburg, VA; Richmond, VA; Petersburg, VA; Rocky Mount, NC; Wilson, NC; Selma, NC; Raleigh, NC; Cary, NC; Durham, NC; Burlington, NC; Greensboro, NC; High Point, NC; Salisbury, NC; Kannapolis, NC; Charlotte, NC; and forest, farms, and rivers in between. We would leave Charlotte on the Crescent. If you missed the earlier sections of this report, click here: "America by Amtrak". We returned to Washington, DC Union Station (above) by Uber from our Holiday Inn Express in the NE section of DC for our Amtrak Carolinian coach trip to Charlotte, North Carolina. Leaving Washngton, DC the Gate J sign was excellent with current information and all stops. Good Internet on this train, "Amtrak Connect", like Pacific Surfliners and other Amtrak Commuter Trains. I like the train layout, temperature, next station, arrival time, etc. As we left DC, we passed an office building showing our reflection, reminding me that we were on our first single-level train of this trip around America. Private boats and construction cranes along the Potomac River. Capitol Hill Exit off I-395. We could glimpse planes at Ronald Reagan Washington National Airport from the Carolinian. Convenient pocket schedules help you identify stations. Interesting artificial palm trees at a Potomac River pier. A well-behaved boy plays while mother rests across the aisle from Matt. The coach car on this train was uncomfortably hot. To remedy the situation, since we were on this train until 8 pm or later, I took the following steps (and added them to the section of this report called, "Tips for Amtrak Travelers." Step 1: Take a walk through the other cars to see if the situation is better. While doing this, look for 2 seats together, or one if you are a single traveler. Step 2: Return to your seat and get some of your stuff and take it to that open seat and lay it on the seat. Maybe a newspaper, hat or jacket. Maybe even put down the tray table so it looks occupied. Step 3: Return for the rest of your stuff and YOUR SET CHECK from above your original seat with an abbreviation for the station where you will detrain. Take your stuff and put it above your new seat if necessary. Alternative: If there is no better seat in another car, check the seat checks as you walk through to see if anyone is getting off at the next stop. If so, be prepared to move to a new seat, with your seat check and your stuff, after the passengers detrain and before new passengers board. Step 4: Enjoy your new, sweet smelling, cool/warm, environment. The Young-Sweetser Co. originally occupied this spot – they built the warehouse in 1919 and added the grain elevator tower in 1920. The owner of the surveying company, HGP Inc, bought the place in the early 2000’s and has worked to restore the exterior which included putting a fresh coat of paint on the Purina checkerboard. There aren’t stairs up to the top of the tower – only a ladder. has 5 to 9 employees and has been in business 146 years! Lumber mill and drying cone in the flatlands of North Carolina. Railroad spur off the mainline to Milford Terminal. The Trackside Grill, whose name was derived as an intended pun, has nothing to do with the railroad it lies next to, but rather the pictures of local and famous racehorses that line the walls inside. And, "if the walls could talk...", one would learn of all the past businesses it has housed including a bowling ally, a gym, a supply store, several other restaurants, and most notably, the first real movie theater in Ashland, built by Mr. and Mrs. D.H. Covington in 1927. Some local characters, and even our own staff, claim that the restaurant is still haunted! I took 5 non-overlapping photos of this facility with this many vehicles in each photo. With an old Railroad Station Sign hanging on a store, Wilson looks depressed. Perhaps the loss of this industry south of town is one cause for Wilson's demise. Town of Lucama, North Carolina water tower advertises "Heart of Tobacco Country"
A rusty, small barn with many side doors usually means that it was a barn for drying tobacco. Tobacco plants are to the right of the barn, but short corn, already tasseled out, means it might be pop corn rather than field corn used for cattle. A large field of tobacco. Tobacco in northern states was by allotment, so this big of a field was unusual to me. Typical small town brick store with a Pepsi sign painted years ago. Another large tobacco field. This field was more mature having blossomed out. In my day they would soon cut it and hand it in the special barns to dry. Our train made a 90 degree turn to the west at Selma. As you can see in this view, the track we came down on goes on the east side of the station, we go diagonally to the right with the station inside the triangle that is formed by the tracks. Selma Amtrak Station that faces three tracks. 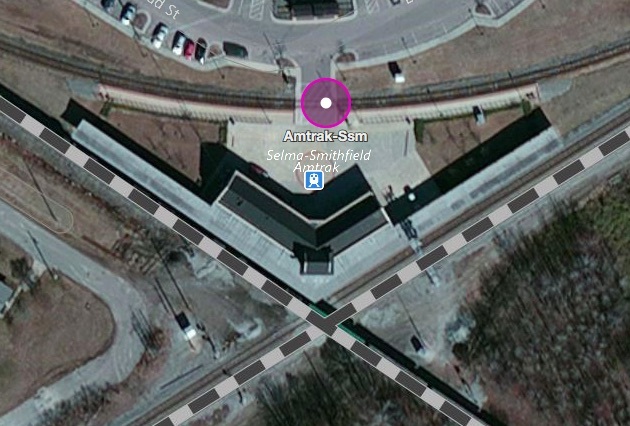 Aerial view of the Selma Station. The Carolinian stopped on the curved track. Identical platform foof on the west side of the station. Trackside prison in Cary, North Carolina. Cary, North Carolina Amtrak Station. This young man in Cary, North Carolina doesn't like the horn on our Carolinian train. This vintage Durham, North Carolina building has been many things, and Tobacco was involved in the lineage. A familiar name even to a non-smoker. Restored caboose in Burlington, North Carolina. This Norfolk & Western caboose was given to the City of Burlington by Norfolk Southern Railway in 1993. It is symbolic of the railroad roots of the North Carolina Railroad town of Company Shops (1866) which became Burlington in 1893. The caboose was painstakingly restored in 2006-2007 and is now a museum depicting life aboard a train as it was when a caboose rolled behind every freight. Twenty-five minutes west of Burlington, traveling train crew accommodations? Charlotte, North Carolina's new Blue Line the next day.